My brain, it no longer works. My stomach, it’s so damn confused. What is this Napoli Crispy Pizza chicken from KFC? What is this life? Because it looks like they took fried chicken and added the only thing better than fried chicken (psst, pizza) to it. So it’s pizza fried chicken? Pizza flavored breading on fried chicken? Is this even allowed? 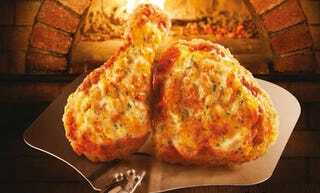 Found by Burger Business, the ad for KFC Hong Kong’s Napoli Crispy Pizza Chicken only highlights mozzarella and cheddar as the main ingredients so who knows if there is any actual marinara action going on or if it’s just cheese stuffed fried chicken (I would be fine with that t00). I know nothing. I just know I must question all fried chicken from now on and wonder why it isn’t pizza fried chicken.